Notes: I was adventurous and started this without doing a swatch first. I figured it wouldn’t be too big of a deal since it’s a top-down raglan and adjustments are relatively simple to make. I made the collar on size 7’s and realized the gauge was too small, but I like the way the collar turned out anyway, so I left it alone. I switched to size 8’s once I got to the yoke to get closer to gauge but it was still smaller, at 20st/24r. 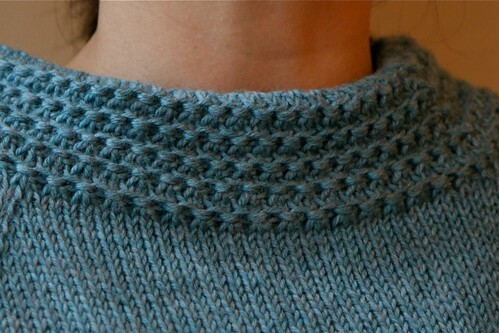 I knit the collar in as I went along, rather than waiting to sew it in at the end. 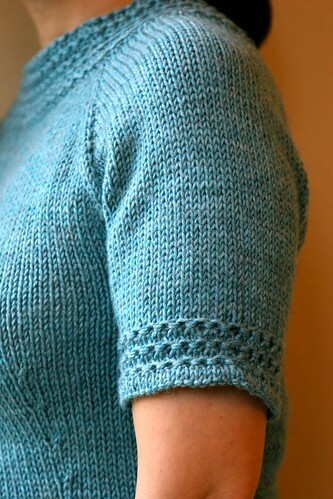 For the raglan increases on the yoke, I spaced them further apart towards the end. After the 12th increase, I set them every 3rd row instead of every other. In part, this was to help make up my row gauge difference, but it also changed the slope of the increase and helps to prevent some of that fabric excess that often happens near the armpit on raglans. 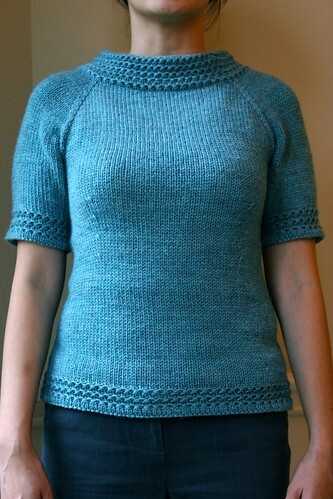 I picked this up from knitting Hargreave’s Jasmine, and I think it makes for nice shaping. As you can see in the picture with my arms down, there is still some bunching, but not too terrible. 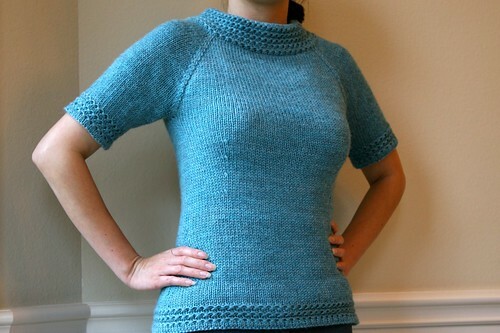 I like the way the waist shaping is done in the front and back just under the bust and at the sides along the hip. I think I will use this method in future sweaters. I didn’t have any problems with the sleeve hems flipping up, but nevertheless, I did those hems in a similar way, just for consistency. The only difference was that on the sleeves, I went down 1 needle size starting on row 4 of the last pattern repeat and also decreased by 2 stitches on that row. After purling 1 row for the turning ridge, I kept the same needle size but decreased another 2 stitches on the next knit row. The yarn is really nice and easy to work with. It doesn’t feel plasticky like some other superwash yarns. It’s pretty soft and comfortable to wear. I think most people could easily wear it next to their skin, but I’m extra sensitive, so I did feel more comfortable with a tank on underneath. So simple and cute. I love it. Welcome! 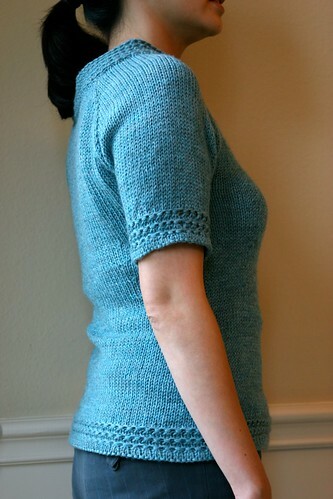 This is the gallery for SoKnitpicky. 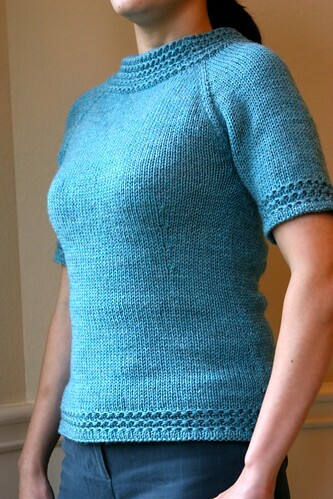 I hope you'll enjoying browsing my knitting and crochet projects. Items before 2010 have individual entries. Items since 2010 are linked to project pages on Ravelry that can be publicly viewed. 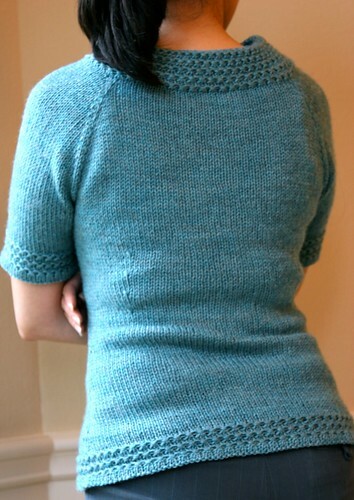 If you are already a Ravelry member, you can see all my projects there.